Photo Credit: Jenny RisherEminem now has some shiny hardware to mark a major milestone of his career. 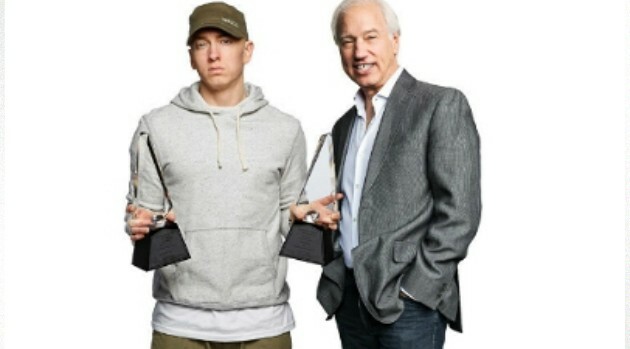 The rapper is the only artist to earn two Digital Diamond awards, and he was recently presented with two trophies by Chairman and CEO of Recording Industry Association of America, Cary Sherman. Although he’s not smiling in the photo, we’re sure the rapper is pleased to have sold over 20-million downloads of his two singles “Not Afraid” and “Love The Way You Lie” featuring Rihanna. Both appeared on his 2010 album, Recovery. The rapper also has two diamond albums — 2000’s The Marshall Mathers LP and 2002’s The Eminem Show.